I buy the large economy sized bottles. Eggs scrambled with sliced fresh jalapenos, onions, and shredded cheddar. The gentlemen of the wrecking crew are here, tearing out the front deck. The cats are a tad upset, as is Princess Annie, but the boys are taking the commotion in stride. It will be quick fix meals and sandwiches from leftovers for a spell. Don’t cry for me, the leftovers include some juicy and delicious Italian beef. 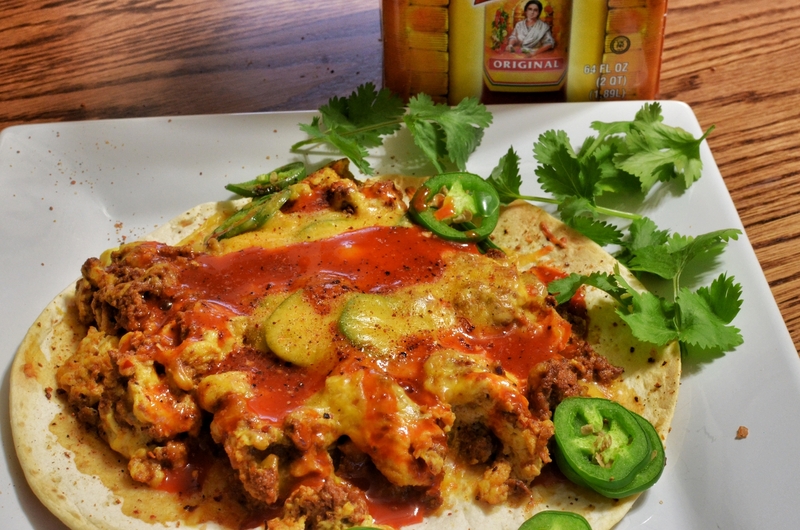 These are assembled with scrambled eggs and chorizo sausage with the usual garnishes of onions, salsa, cheese, and jalapeno slices on flour taco sized tortillas that were fried briefly – less than a minute in the deep fryer. More than that and they become tostadas and will be too crumbly to fold up in your hand. Chorizo quesadillas with cheddar and scrambled eggs. Mmm… Mushroom and olive scramble. Sauteed some brown mushrooms this morning in olive oil, then dumped in some halved olives and two beaten eggs. I topped the dish with some jalapeno flavored queso blanco and toasted a split sourdough bun. Yes, I admit it, I love olives. There will be more. I’ve mentioned these before, just search Amazon for Byzantine Olive Antipasto. They come in a plastic bag, I opened it and dumped them into a more fridge friendly gallon sized plastic jug that originally held whole dill pickles.